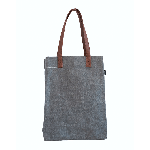 The Maika Waxed Ash Market Tote is soft yet durable, and at a size that makes it an easy carry-all. Featuring a nifty strap with hook to attach our pouches, or keys, the Maika Waxed Ash Canvas Market Tote is made from recycled canvas and hand printed with eco-friendly pigment inks. Dimensions: 12" x 16" x 4"